Nutritional yeast, fondly called “nooch” for short, is an inactive yeast made from sugarcane and beet molasses. It is quite similar to the active yeasts found in breads, but it has no leavening ability. Nooch is commonly used as a topper for dishes like popcorn, pasta, and French fries. It is often used to mimic cheese in vegan dishes and to thicken sauces and dressings. Though it allows for some amazing variety in a vegan diet, nutritional yeast is not reserved just for vegans. It is delicious with a cheesy, umami-like flavor and is a healthy addition to anyone’s diet. 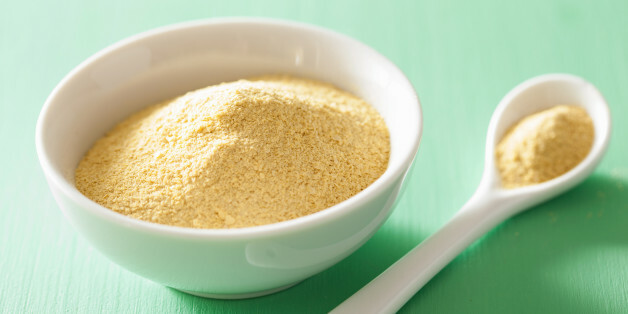 Nutritional yeast is popular as an ingredient in cheese substitutes as it has a strong flavor that is often described as nutty, cheesy, or creamy. It is produced by culturing the yeast in a nutrient medium. The growth medium is either sugar cane or beet molasses. When the yeast is grown, it is deactivated using heat after which it is harvested, washed and dried. Nooch is yellow in color. It is packaged and sold in flakes, granules or a powder-like form. Nutritional values for nutritional yeast vary from one manufacturer to another. Nutritional yeast is particularly rich in B vitamins. It is a great source of vitamin B6 and is usually fortified with vitamin B12. Unfortified nutritional yeast provides from 35 to 100 percent of vitamins B1 and B2. About 2 tablespoons have 60 calories with 5g of carbohydrates (four grams of which is fiber). Nooch has complete and digestible protein, with essential and nonessential amino acids. It provides all the nine amino acids the human body cannot produce. A serving provides 9 g of protein. It also contains minerals such as chromium, intracellular antioxidants like Glutathione and phospholipids such as lecithin. Nooch is also low in sodium and fat, gluten-free. It does not contain any added sugars or preservatives. Nutritional yeast may help lower cholesterol naturally due to its selenium content. Selenium reduces inflammation and prevents platelets from aggregating, which is necessary for blood clots to form. Blood clots can lead to stroke, heart attacks, kidney failure, etc. The niacin found in nutritional yeast helps to minimize the LDL triglyceride and cholesterol levels which in turn accelerates the secretion of high-density lipoprotein or HDL level in the blood. Nutritional yeast has antiviral and antibacterial properties. It has proven to be one of the best remedies for chronic candida symptoms, a specific type of yeast infection. Regular consumption of nooch helps maintain healthy bacteria balance in the gut which is important for immune health. Nutritional yeast has many digestive system benefits The probiotics in nutritional yeast may help cure diarrhea. Since it does not contain any dairy products, nutritional yeast has also been found helpful for those who suffer from lactose intolerance. Iron deficiency anemia is the most common type of anemia, and it occurs when your body doesn’t have enough of the mineral iron. Fortified and unfortified nutritional yeast both provide iron . Fortified yeast provides up to 20 percent of the recommended daily value. Protein is an important building block of bones, muscles, cartilage, skin, and blood. Vegans and vegetarians often struggle to find enough protein sources in the diet. Nutritional yeast is a complete protein and it contains all nine of the essential amino acids at only 80 calories a serving. Nutritional yeast contains many B vitamins, all of which tend to benefit healthy hair, skin and nails. Vitamin B7 or Biotin is essential for maintaining the texture, tone and strength of your hair. Vitamin B5 can minimise acne by breaking down oils in the form of triglycerides and cholesterol. The niacin content in nutritional yeast helps reduce fine lines and wrinkles, red blotchiness and even chronic acne. Nutritional yeast is a great choice for pregnant women as it is rich in folate. Sufficient consumption of folate during pregnancy may help prevent major birth defects such as spina bifida. Pregnant women require 400 to 800 micrograms of folate daily. Just one tablespoon of nutritional yeast contains 1,059 micrograms of folate. Since the yeast is completely pasteurized and deactivated, it is quite safe and it will give rise to yeast overgrowth in someone who consumes it. There aren’t any recorded risks in consuming nooch, unless someone has a specific food allergy to it. A sensible approach to experimenting with new foods is to try consuming it in small amounts and see how your body reacts to it. Nooch has so far proven to be a safe and healthy alternative to cheese for vegans. Nutritional yeast can be used as a condiment. Simply put the powder form in a shaker and sprinkle it on all your meals – soups, popcorn, salads, etc. Add it in any recipe that calls for a cheesy flavor. To make this cheesy vegan hummus recipe all you have to do is toss in some cooked chickpeas, a clove of garlic, a little tahini and a scoop of nooch into a food processor. Add salt and lemon juice to suit your taste buds. Drizzle some olive oil and add a dash of paprika – you have made the world’s best cheesy hummus! There are plenty of ways to add nutritional yeast to your diet. Here are 7 delicious vegan recipes using nooch. You can make gravies, dips, hash browns, corn dogs, cauliflower buffalo wings and many more!